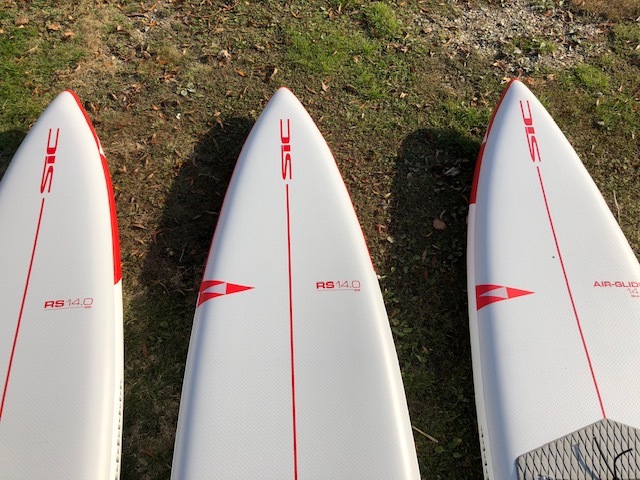 SIC Maui Inflatables "Air Glide series 2019" is available. Testbericht kommt bald. Aber vorne weg kann ich so viel sagen das sie absolut Top sind! Jedes Board ist eine sehr gute Alternative zu einem Hartboard wenn man Probleme mit Lagerung und Transport hat, und Preislich auch! Sie sind nicht die günstigsten aber jeden Cent Wert! Wer ein richtig Gutes Produkt möchte und langfristig Freude damit zu haben der ist hier zu 100% richtig! Ab sofort erhältlich und zu empfehlen! Show up, pump up, keep up. 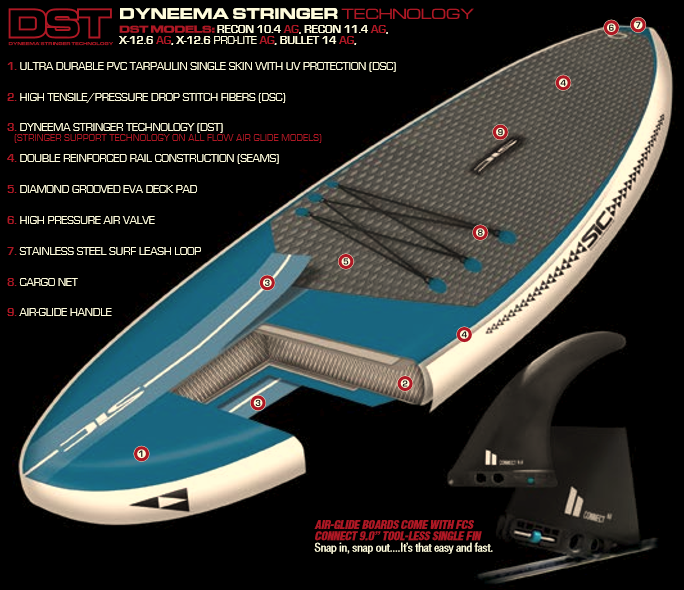 Introducing the fastest, lightest and stiffest inflatable raceboard on the market. 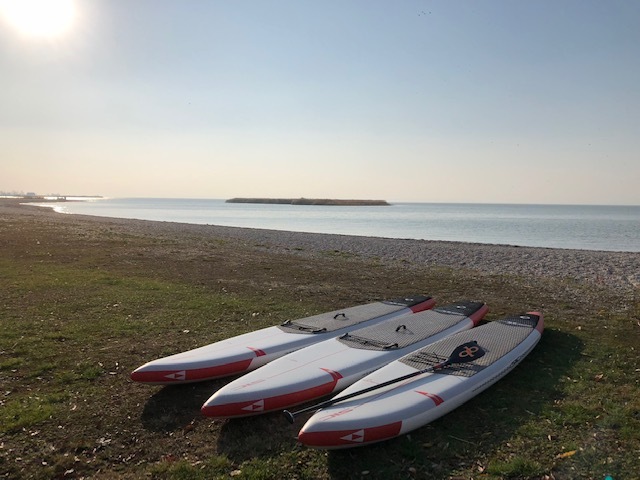 Crafted from the same pedigree as it’s SCC brother, the all- new Air Glide X-12.6 Pro features water shearing lines, a low profile displacement hull design and race handles for beach starts and finishes. Dyneema Stringer Technol- ogy provides unparalleled rigidity though the bow and center lines of the board. 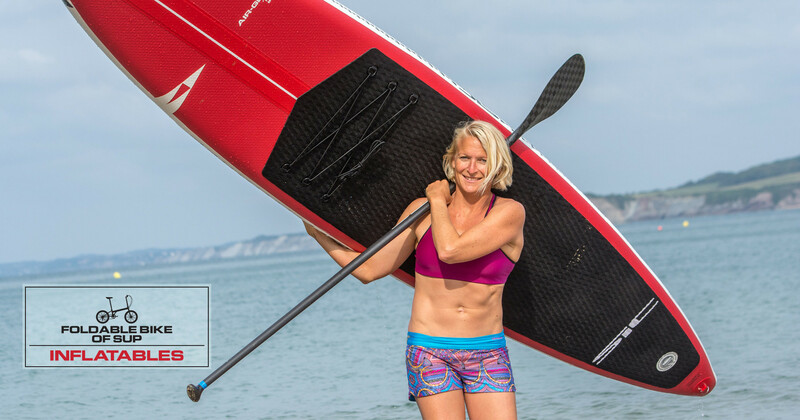 This board will be a frequent face on the podium of the inflatable class in 2017. 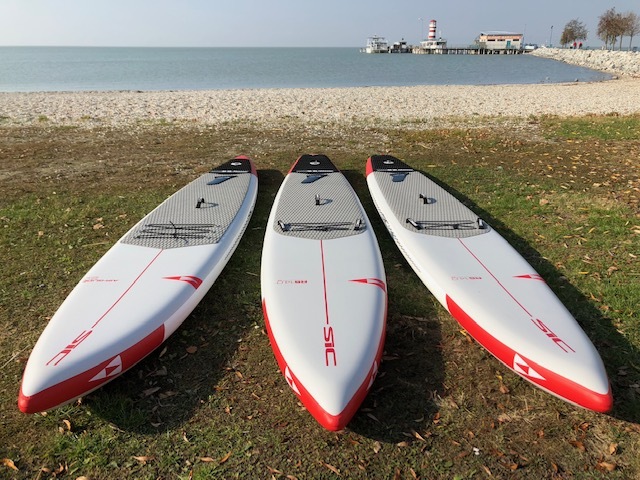 Das Air X12Pro ist das ISUP Race board in der 12,6er Klasse! Im Vergleich zum Pro-Lite mit 24 breite ist das Pro mit 26 breite genau richtig Stabil! Auch für etwas schwerer oder größere Paddler/inen! Wer ein 12,6er ISUP Race Board sucht hat mit dem SIC Air X12Pro genau das richtige und das beste in der Klasse! Auch das Zubehör ist Top! 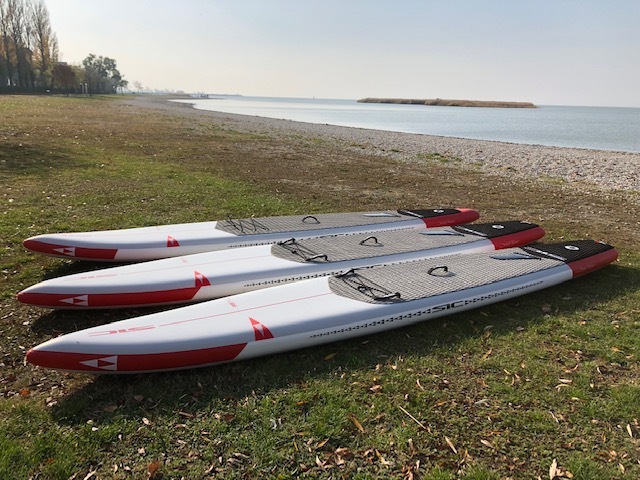 Sharing basically the same dimensions of the X-12 SCC/TWC composite boards, this touring / fitness / race board is perfect for family fun, fitness and for competing in the 12’6” inflatable race class. 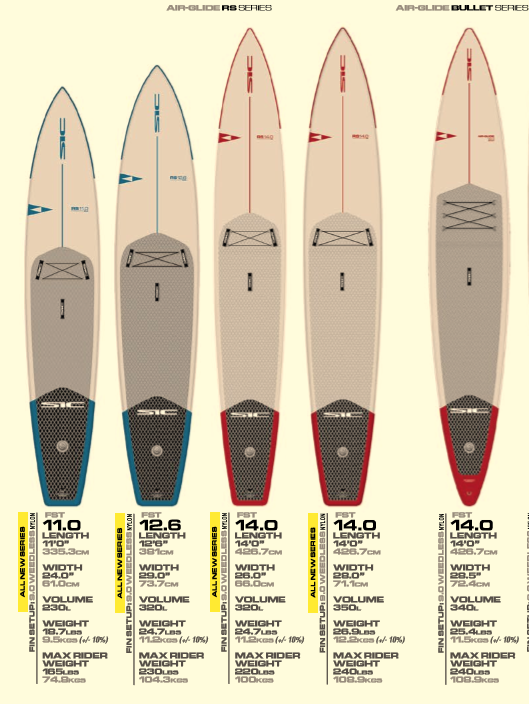 The X-12.6 Air-Glide is the stiffest board in its class at 15 psi. While this board is a great recreational fun, we are also confident that it is also one of the fastest race board in its class. 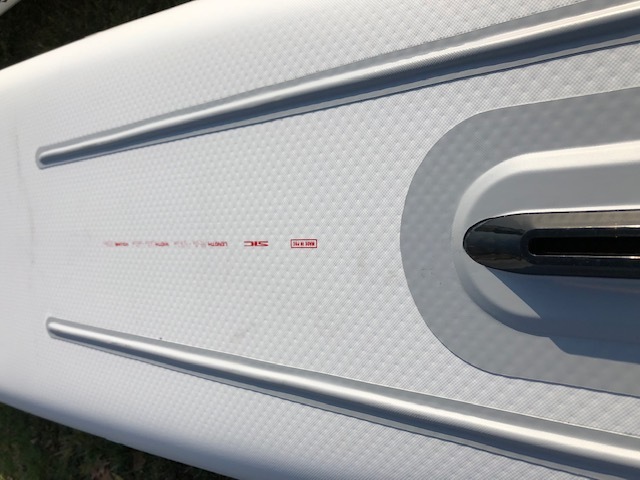 The low drag fin make this board fast or with the U.S. finbox, which is standard on all SIC Air-Glide inflatables, you can put any fin on you like. 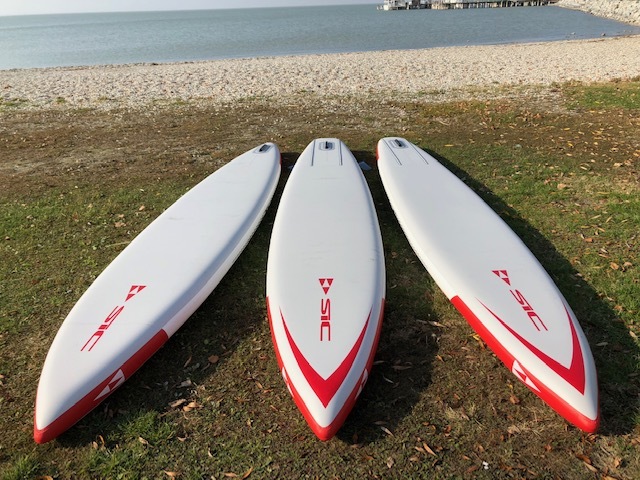 As the inflatable fitness, cruising and racing demand have grown for inflatables, SIC continues to serve up what its customers have asked for in an all-water, multi-discipline, displacement shaped inflatable. Having more volume in the nose, wider tail and slight increased rocker versus its next of kin the X series, the FX can do it all. 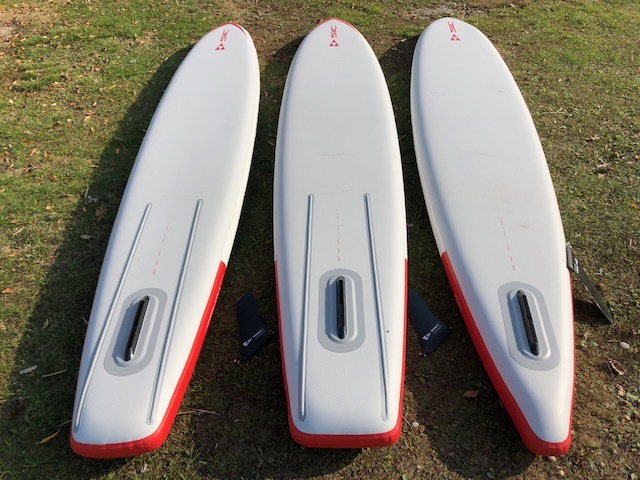 Designed for a mid sized paddler looking for long glides or the larger paddler looking for a stable board with increased volume. If it is distance you want to put under your belt, whether for a long afternoon grind or an expedition, this board can go the distance. 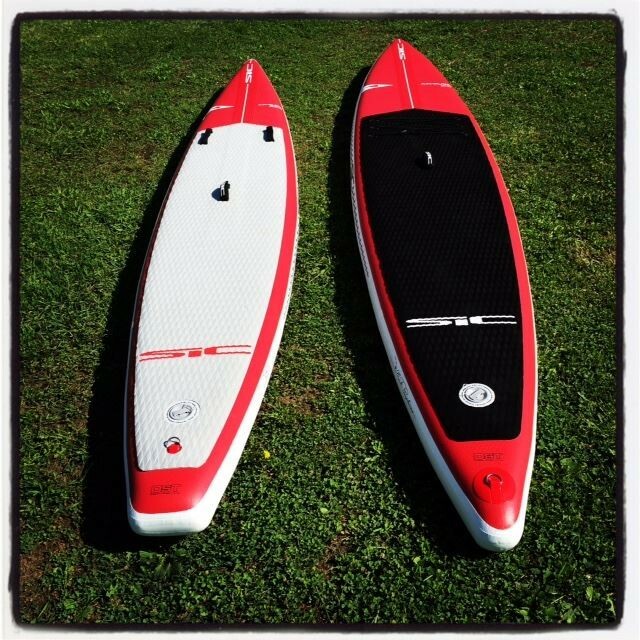 Das FX 14 Pro ist ein Sensationelles Aufblasbares Race / Touring Board! Es wirkt fast wie auch am Bullet wie wenn es ein Hartboard wäre wenn man drauf steht! Es ist SUPer schnell, sehr stabil und easy zum turnen! Dein Board für Sportliches Paddeln! Das Air Bullet14 ist für mich die Überraschung des Jahres! Das Board ist der Hammer! Es gibt nichts was es nicht kann, egal ob schnell am Flachwasser oder zieht super gegen die Welle oder auch und das freut mich am meisten im Downwind - Typisch SIC Bullet! Für ein 14er ist es eigentlich auch vom Gewicht sehr leicht, es ist schnell und Stabil aber auch kein Floss das sich nicht bewegt im Wasser! Es macht einfach Spaß damit zu paddln! 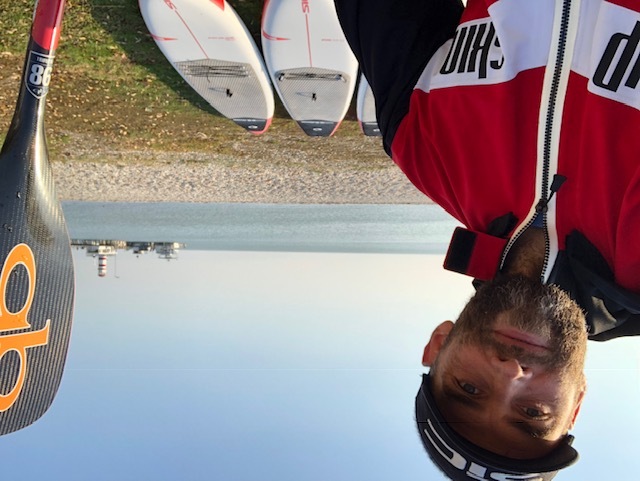 Kräftiger Teamrider mit 110kg hat richtig Freude mit dem Board, sprich Gewichtslimit irgendwo! 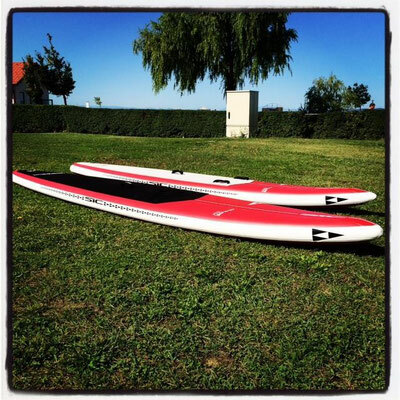 Es ist eine richtig Feine Alternative zu einem Hartboard auch zu dem Preis! Für mich waren 14er ISUP immer ein No-go aber das Board hat mir neues gezeigt und das freut mich das man jetzt auch 14er ISUPS paddln kann und das Spaß macht, richtig Spaß macht! Deswegen die Überraschung des Jahres! 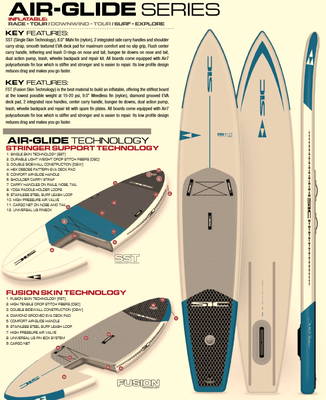 Das Air Bullet war das ISUP Board des Jahres 2016 und bin auch sehr zuversichtlich für 2017!!! 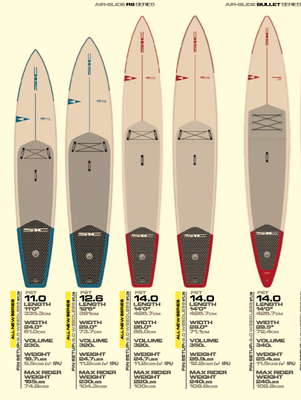 This classic longboard style all around surf / fitness board is a great to please the kids, the wife and the wallet. Dad’s love all the Air-Glide boards because you can spend the day horsing around you won’t have to spend the whole night patching up holes. Even punctures are easy, as the board is equipped with a repair kit if you happen to drop the anchor on it. The Recon 11.4 Air-Glide has a huge range, for riders nearly any weight. 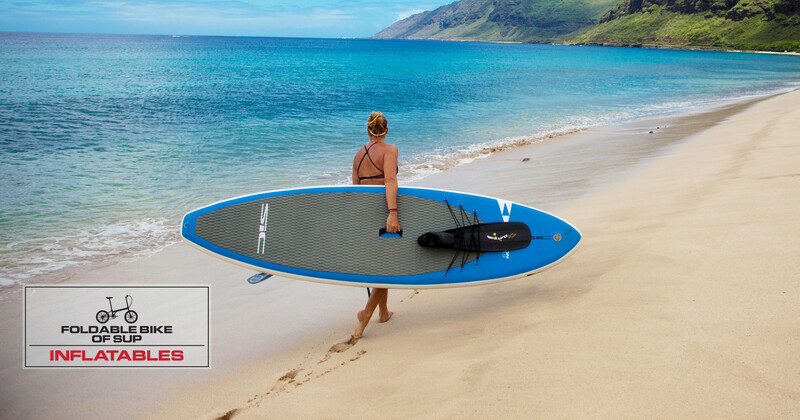 At 15 PSI, its super stiff and at 6 inches thick, the volume is abundant, this board can float the whole family. The FLOW Inflatable series is the inflatable alternative to the GCI and FCI versions of the FLOW 9.6, 10.6 and 11.6. 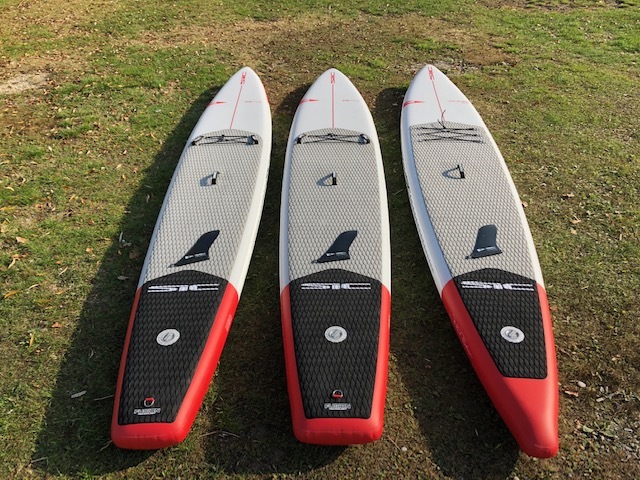 With all of the same attributes of our Air Glides, but more generous volumes, the FLOW inflatables are a stable and economical first step in your SUP career. 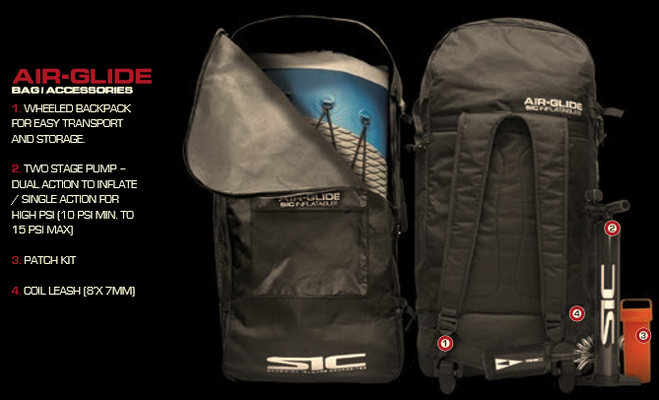 New for 2016 is SIC’s Stringer Support Technology (SST) which, provides structure and rigidity to the board when inflated, but collapses and folds to store inside of a backpack. 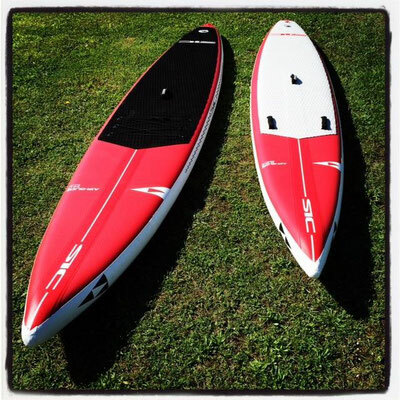 Who knew SUP could be this easy and fun?